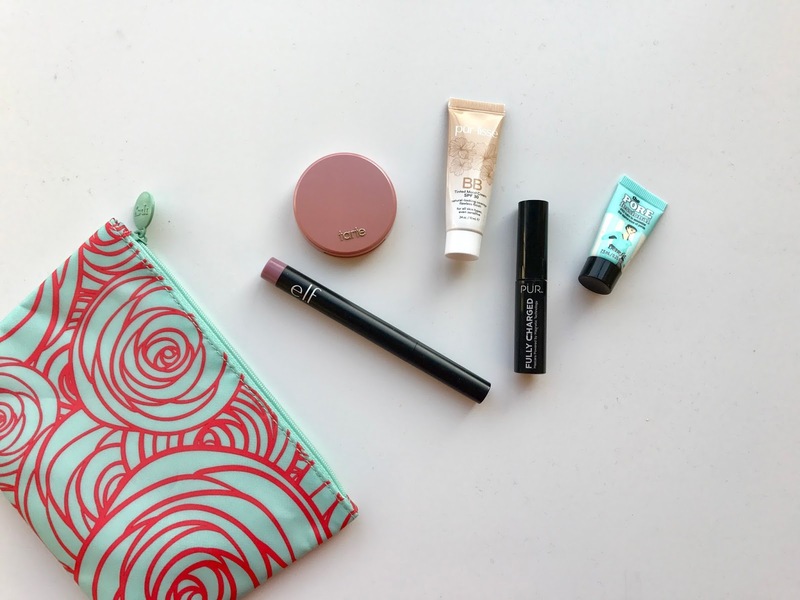 Basically Joy: Every Day Beauty Essentials + $75 Giveaway! Happy Thursday my fearless readers! August always seems like such a busy month. I'm not in school anymore but I can only imagine what it's like for those that are or who have little ones headed back to school. Today, I'm sharing the 5 makeup products I can't go a day without. These five products make my entire face every single day! They are also perfect to have on hand when I'm running late because they are in my purse ready to brew some magic in the car (this happens more often than not). Don't get me wrong, I LOVE a good highlight and contour but I do not have the time, and some days the energy, to do all that at 6 in the morning! If this were a post on the essentials for date night or girl's night out, this would be a much longer list because I go full out when I get the opportunity. I want to throw in this disclaimer. I am not a professional makeup artist (check out my favorite hometown girl, Callie Ann Artistry, for serious makeup inspo and fitness envy) and nor should I be. 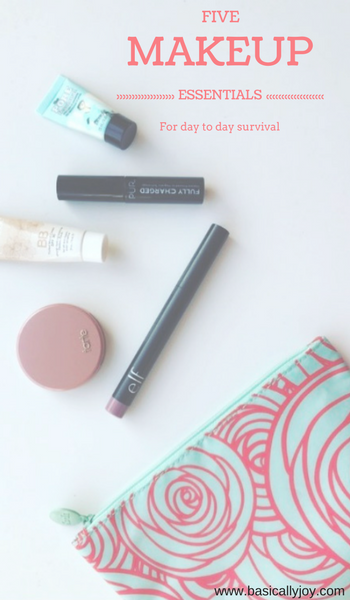 These essentials are coming from a non-pro, every day, work grind girl. I know the majority of women are exactly that so I hope many of you can relate to this and it helps get you through those hectic days! All of the specific products are what I love and recommend to anyone but definitely make sure you have any brand of the products listed. 1) PRIMER | Benefit POREfessional Face Primer - Oh man does this stuff rock! I have pores that you can see from the moon and this really helps minimize the appearance of them! It leaves your skin feeling silky smooth ready to glide on your BB cream or foundation. Use in moderation, don't coat that face girl! 2) BB CREAM | Purlisse BB Tinted Moist Cream - Confession: I had never used BB cream until this summer. Texas heat melts your face off so my full coverage foundation was just too heavy! I ended up using this because I ran out of foundation and by that I mean, I had been putting off trekking to Sephora to pick up more for too long. I had received this Purlisse BB cream in an Ipsy bag a few months back and instantly fell in love with it! I use the shade "Light" and it blends perfectly with my fair skin. I don't notice any patchiness throughout the day either. This is a great alternative to heavy foundation in the summer! 3) BLUSH | tarte Amazonian Clay 12-hour Blush | "Paaarty" - This has claimed the prize for my favorite blush of all time. This is my favorite color but you can't go wrong with any of the options (15 to choose from)! This has pigment that glides on, no issues with clumping, and stays on. I wore this to Orange Theory the other night and it was the only thing still in place! I use a small amount since it has great deep pigment so always tap off the brush to remove excess! 4) MASCARA | PUR Fully Charged Magnetic Mascara - Not to toot my own horn, but I feel like I have pretty decent lashes to begin with for having no extensions and not using any booster to grow them, but this mascara is the apple of my eye. It lifts, separates, and lengthens without getting those spider eyelashes! This mascara lasts quite awhile and I don't feel the need to dip it to get more for each eye, which is a money saver (every little bit counts, right?). 5) LIP | e.l.f. Matte Lip Color | "Tea Rose" - I'm obsessed with matte lippies because gloss, for me, is just too much for every day work life. For my fair skin, this dusty rose is perfect for a little pop of color without being too overpowering. The color goes on smooth and I don't feel the need to touch up throughout the day (even after my morning coffee)! Plus, for $3, you really can't go wrong giving this a try! If you don't carry a makeup touchup kit in your purse, get one thrown together! I always have these 5 items ready for a touch up before those last minute "hey can you give this presentation to the entire staff in 20 minutes?" or after the gym if I need to be seen in public. Let me know what your "go to" makeup products in the comments! Porefessional is the best!! I have been wanting to try the Tarte blushes since everyone seems to love them. I'll have to hop on the bandwagon! We use the exact same blush! I love to see products that can be used by so many different skin tones. I have that BB cream and I love it. I need to try some of these! I love Elf products! I always wondered what primer was for, thanks for letting me know in your review of the product. I use that exact same BB cream! It's one of my favorites because it's not as dewy in finish than others I've tried. If you want one with more coverage, I'd totally recommend looking into Dr. G My Skin Mentor. I got that blush for my birthday gift from sephora - love the color, but wish it stayed longer! I've heard good things about Porefessional and actually think I was given a sample size for my birthday. I really need to get on that and try it! I must try the tarte blush. I've been looking for some for a while. I need a new blush color desperately! I was pleasantly Price by how much I really love the elf Matte lipsticks as well. I also agree the professional is pretty great!! These are great essentials! I personally use WAY more than that every day but I'm a little obsessed LOL. Those are perfect for a light face in the summer. LOVE these picks. this Texas heat definitely does a number on makeup, love using a bb cream for that reason! 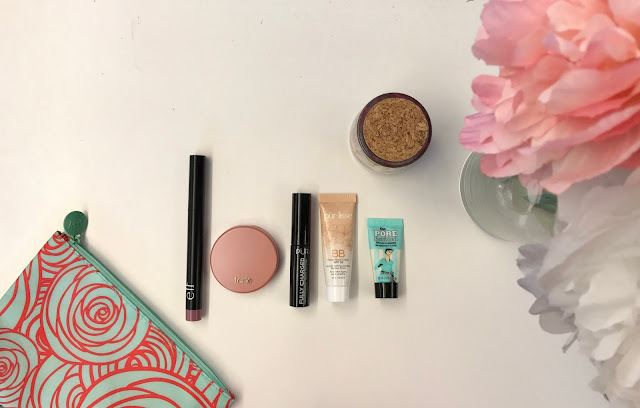 So many great picks, POREfessional is one of my absolute favourites and I LOVE the tarte blushes, exposed is my go-to shade! I can't live without the POREfessional! I agree, it's definitely a must have! Zella Leggings: Worth the Splurge? August Goals: Accountability Starts Now!